I am a big fan of grilled tilapia. It taste so yummmm!! Seriously I am a roasted fish lover. My best part is when robbing the fish inside out with all those nice spices. My girls just love the fish laying on their plates and looking at them ‘scary’. 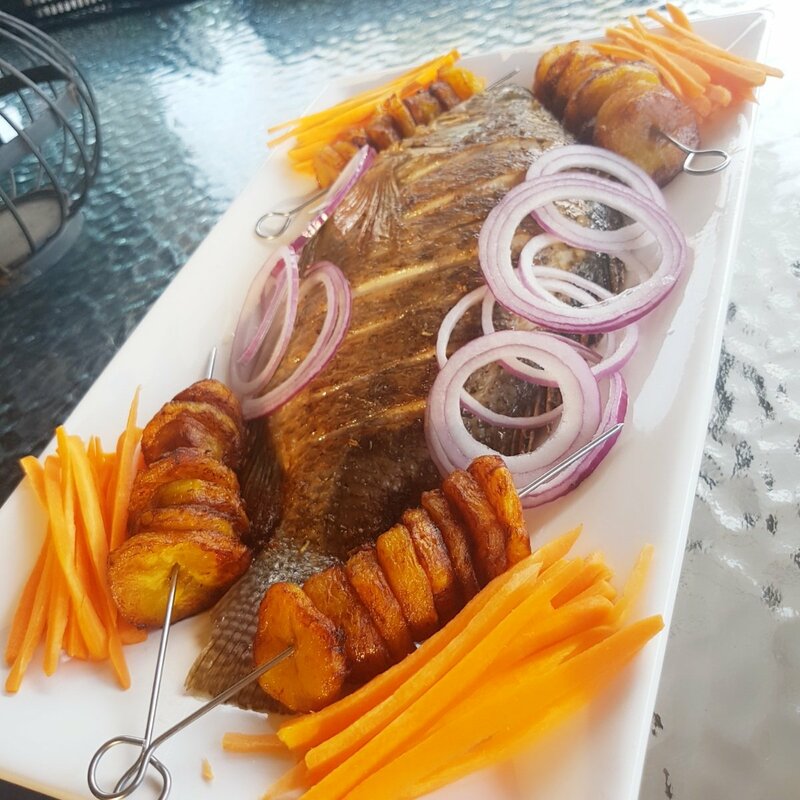 It’s always fun grilling a full fish at home . So much excitement from my kids . They will act as if the whole fish looks scary and like the fish is alive. I even make fun with that telling them that it can bit their fingers. Back in Africa along the streets in the evernings, It’s very common to find business women and men grilling fish by the road sides. There is a place in the city of Douala called “Rue de la Joie” English translation The happy street. In the evernings that street quiet busy and full of fish grillers and hundreds of people trying to buy grilled fish. 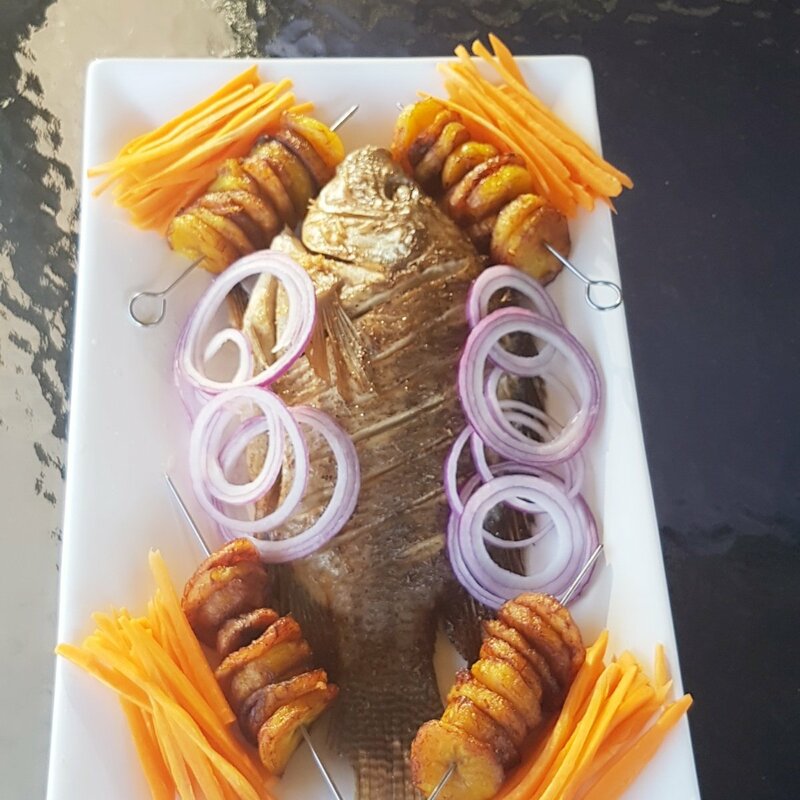 Those fish are well marinated with African organic herbs which gives them a delicious flavour. I am an adventurous cook and eater . I will taste and cook just anything. I am not a fan of roasting skinless fish but l can handle that. I have a way of doing that which l will explain to you in a different post. Thoroughly wash fish and remove all the unwanted parts. Use a shape kitchen knive to diagonally cut some deep lines right through the bone . This is to give room for the seasoning to penetrate deep into the skin of the fish. Use a food processor and or a coffee grinder to blend all the dry and fresh ingredients to paste and dust. Use some olive oil or water if too dry. Combine your blended spices with 3 tablespoons of olive oil and lemon. Use a kitchen brush to marinate and coat your fish. Make sure the brush robes all parts of the fish. Reduce heat to low and allow your fish to grill . If you want a crunchy grill then don’t cover your grill . Leave open. 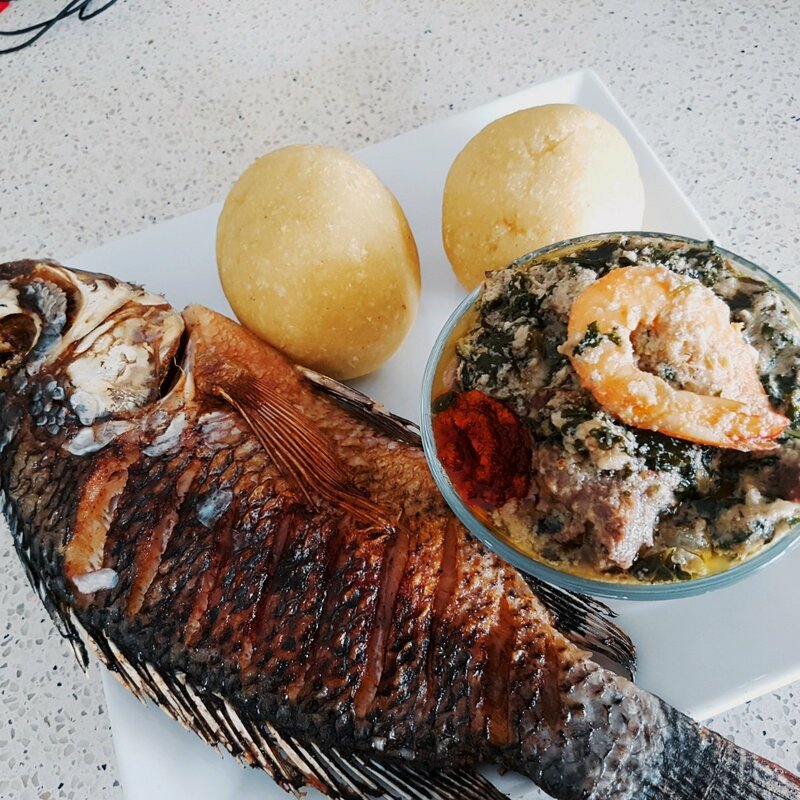 The fish should cook on both sides for 7 mins which gives a total of 14 mins. If your fish has a pretty thick skin layer then grill for 10 mins on both sides . Make sure its cook to the bones. Turn off grill and leave it there for 5 mins before serving. Serve with some delicious pepper souce accompanied with some fried or grilled plantains or miondoh/ boiled casava. Its up to you to serve it with whatever side dish for food you want . Previous Post Best Mexican beans recipe. Thanks so much my dear friend . I will contact you and we shall talk more on this . Hey Queen… we need to talk about your book. There is this program you can use to write, LyX. And you can do self-publishing and host PDF copies for sale on your blog, with payment options. If you want to go further, you could publish with Lulu.com. Here you pay for producing only for hard copies people order. You do not have to be tricked by publishing houses who will want you to pay a huge sum upfront. Keep up the good work.